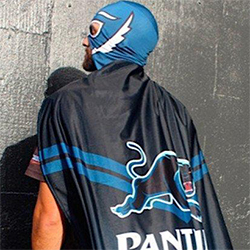 The NRL was keen to have Penrith play this Saturday’s Elimination Final against the Warriors as part of a double header at Allianz Stadium alongside Roosters v Sharks, but the Panthers very quickly knocked the concept on the head. Penrith were concerned about the chaos around the Moore Park precinct given there’s a sold out AFL Finals match being played at the same time, and felt their match was being treated as second fiddle to the later game. There was also issues surrounding dressing room access. 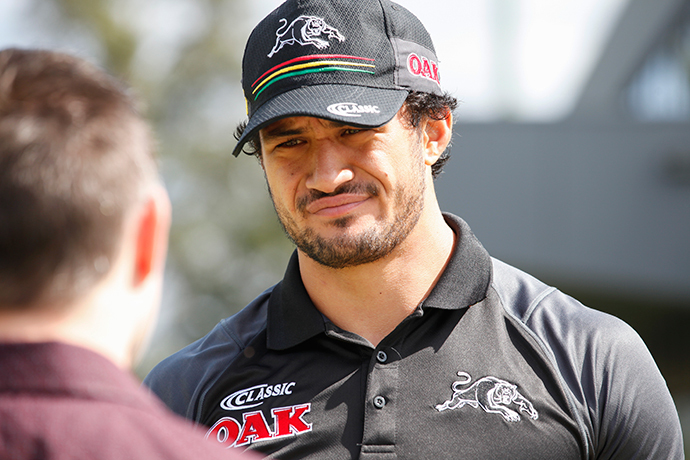 Penrith requested the game be moved to Panthers Stadium but eventually settled on ANZ Stadium. While not playing at Penrith is understandable, you can accept why fans find the whole thing confusing given the Panthers are the only ‘home’ team not playing at their regular stadium this weekend. The Panthers have granted Corey Harawira-Naera an early release from his contract to join Canterbury in 2019. Panthers General Manager Phil Gould said while the club would have liked to have kept the 23-year-old, salary cap pressures came to the fore. “The decision to allow Corey a release from his contract was a difficult one. Firstly it’s a matter of future salary cap management for our club. Secondly it is such a wonderful opportunity for Corey with his new club,” he said. Congratulations to James Fisher-Harris, Corey Harawira-Naera, Dallin Watene-Zelezniak and Dean Whare who have all been named in the New Zealand ‘wider squad’ for the upcoming Trans-Tasman Test. Meanwhile, youngster Dean Blore was named in the Junior Kiwis ‘wider squad’. Penrith coach Cameron Ciraldo has been in regular communication with referees boss Bernard Sutton in recent weeks, raising several concerns about penalties being awarded against his side. Unfortunately it doesn’t appear to be doing Ciraldo any good with Penrith again on the back of a horror penalty count against the Storm last Friday. While Penrith do need to improve their discipline, there’s little doubt that a number of crucial penalties in recent weeks have huge question marks over them. Sutton has apparently admitted this to Ciraldo. 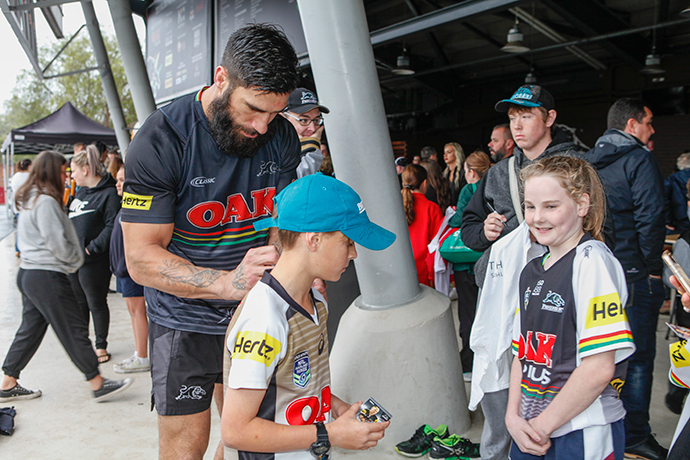 The wet weather didn’t stop plenty of Panthers fans turning out on Monday for an open training session and an opportunity to meet the players. This year’s Merv Cartwright Medal presentation night will be held on Wednesday, October 3. Panthers General Manager Phil Gould raised a few eyebrows this week when he asked Penrith fans on Twitter how they’d feel about playing some home games at the new Western Sydney Stadium in Parramatta. Here’s my answer: No, no, no, no, no, no, no, no. Whilst on the subject of Stadiums, what would Panther fans feel about Panthers playing premiership games out of the new Western Sydney Stadium at Parramatta when it opens? I’m told it will be an amazing facility. One? Some? None? Any interest at all? Spotted: Panthers General Manager Phil Gould and Penrith MP Stuart Ayres in deep discussion at the club’s open training session on Monday afternoon. Could they have been discussing plans for a new Outer Western Sydney Stadium, which after falling from the agenda is now starting to get a few whispers behind it again? Congratulations to Ian Garton from Garton Group McDonald’s and Troy Dodds from the Weekender who finished joint champions of the Western Weekender Celebrity Tipping Competition this year. The drums are beating louder and louder about Ivan Cleary’s potential return to the Panthers next year. Cleary was again less than convincing when discussing the issue at his post-match press conference following the Tigers’ loss to Souths last week. The most likely scenario would be Penrith signing Cleary for the 2021 season and beyond, hoping it triggers a domino effect with the Tigers moving Cleary on immediately and finding a new bus driver. Penrith officials will monitor ‘Mad Monday’ plans to ensure there’s no negative headlines out of this year’s end-of-season celebration, whenever that may be. While this week’s story in the Daily Telegraph about the Bulldogs’ ‘Mad Monday’ celebrations was one of the beat-ups of the year, Penrith knows optics are everything and will put measures in place to ensure nothing gets out of hand.